The rising cost of living, which caused price hikes in certain goods and services recently, is not likely to see more people going into debt counselling, according to the Credit Counseling and Debt Management Agency (AKPK). Corporate Services GM Azman Hasim said the agency expects the number of people seeking help through its Debt Management Programme (DMP) to remain at the monthly average of 1,300 enrollments. 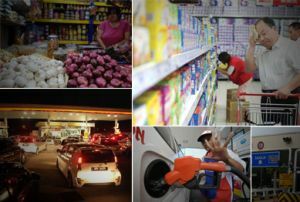 Azman said even though the rising cost of living puts a strain on household budgets, many families are adapting their lifestyle so as not to fall into the debt trap. “Consumers are more discerning with their expenditure during this challenging period and would try their best to live within their means without getting into debt,” he told The Malaysian Reserve recently. Azman said in 2013, there was no extraordinary increase in the number of consumers seeking AKPK’s counselling services. He said the number of new counselling cases in 2012 and 2013 was stable at 13%. In 2013, 16,769 consumers enrolled into AKPK’s DMP compared to 16,110 enrolled consumers in 2012, he said. Housing loans, hire purchase and credit cards stood at the highest rate of 82.9% of January 2014 statistics who enrolled in the DMP. The month’s statistics also showed 4,806 cases successfully exited from DMP with a total outstanding of RM189.6 million while 63,534 active accounts in the DMP with a total portfolio of RM4,587.7 million as at January 31, 2014. With AKPK’s January 2014 statistics showing poor financial planning standing at the highest rate of 22.8% among Malaysians, Azman said the main factors of poor financial planning are usually attributed to lifestyle choices, not living within one’s means and also the lack of financial knowledge as well as lack of discipline in managing their own finances. To eliminate this, financial education must be given priority, he said. “According to a survey in October 2013, we found that 67.4% of the respondents are aware of AKPK’s services while 46.5% of the respondents claimed that if and when they are in financial difficulties, they will approach AKPK for assistance. “This number though encouraging, gives us room to improve on the dissemination of financial management information and we will continue to organise outreach programmes nationwide with the objective of enhancing financial literacy levels of all Malaysians,” he said. The DMP is offered to those who would like to regain control of their finances or those facing difficulties servicing their loans each month. Azman said that through the DMP, AKPK has been able to restructure loans over a maximum period of 10 years.